Learning Objective: Identify the different types of warm-air systems, gas-fired and oil-fired furnaces, components, controls, and the procedures for installation, operation, and maintenance. Heating equipment for complete air-conditioning systems is classified according to the type of fuel burned, the Btu capacity of the furnace, and the method of circulating the warm air. Warm-air systems are generally identified as either a gravity-type or a forced-air type system. Gravity furnaces are often installed at floor level. These are really oversized, jacketed space heaters. The most common difficulty experienced with this type of furnace is a return-air opening of insufficient size at the floor. Make the return-air opening on two or three sides of the furnace wherever possible. Provide heat insulation above the furnace top to avoid a possible fire hazard. Gravity warm-air heating systems operate because of the difference in specific gravity (weight) of warm air and cold air. Warm air is lighter than cold air and rises when cold air is available to replace it. The majority of the furnaces produced today are of the forced warm-air type. This type of furnace includes the elements of a gravity warm-air system plus a fan to ensure adequate air distribution. It may include filters and a humidifier to add moisture to the air. The inclusion of a positive pressure fan makes possible the use of smaller ducts and the extension of the system to heat larger areas without the need for sloping ducts. It is possible to heat rooms located on floors below the furnace if necessary. Forced-air furnaces are manufactured in a variety of designs. A typical oil-fired furnace is shown in figures 4-15 and 4-16. A typical gas-fired furnace is shown in figure 4-17. Figure 4-15. 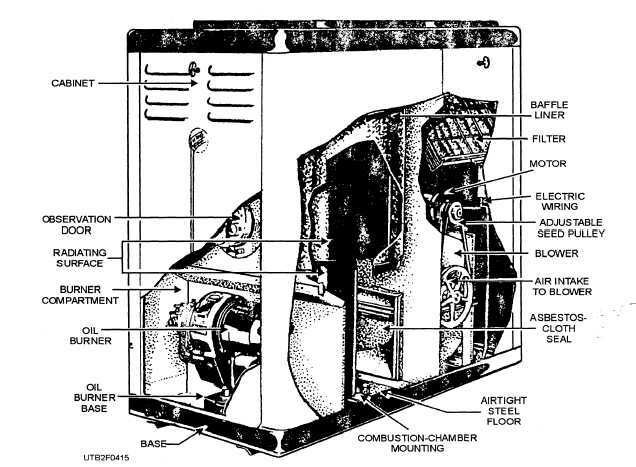 - Cutaway view of a typical oil-designed furnace.